Tajikistan’s national carrier Tajik Air carried 325,300 passengers in 2016, up 4.33% from the previous year, Asia-Plus newswire reports. This result is nevertheless below the level of 2014, when the carrier’s traffic exceeded 371,000 passengers. Traffic growth had a positive effect on the carrier’s financial results. Its total income increased 13% to 461.5 million somoni ($58.4 million), whereas its costs reached 459.6 million somoni ($58.1 million). The airline currently operates five aircraft out of its total fleet of 36 airframes, 30 of which is outdated and kept stored. Tajik Air’s management previously announced intentions to renew its fleet, and the airline has already taken delivery of its first long-haul aircraft, a Boeing 767. There are plans to rent several more aircraft of the same type. In January last year Tajik Air, which had been bearing losses for several year in a row, received a new management team. Khayrullo Rakhimov, who had previously run a private airline Somon Air, became the national carrier’s CEO. Somon Air, formally a competitor, has been a traffic leader in Tajikistan. Tajik Air’s base airport in Dushanbe also improved its year results at the end of 2016. It handled 1.156 million passengers, up 1.85% than in the previous year. Its total cargo traffic amounted to 2,236 tons, an increase just by 14 tons (0.63%). 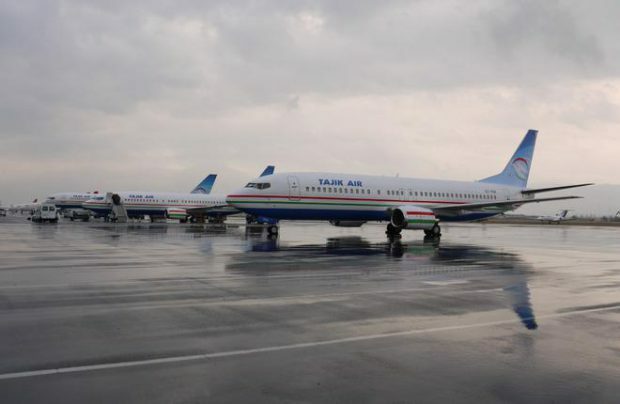 There are 12 carriers operating flights to and from Tajikistan’s capital, five of them international – Turkish Airlines, Kam Air (Afganistan), China Southern Airlines, flydubai (UAE) and Iran Aseman Airlines. Five more carriers fly from the CIS – S7 Airlines, UTair and Ural Airlines from Russia, Air Astana from Kazakhstan and Avia Traffic Company from Kyrgyzstan. The remaining two are Tajik Air and Somon Air. Dushanbe handles an average of 12 regular flights daily.